What Makes a Great Product Development Team? For example, the Product Manager identifies and shares product outcomes for the next quarter via Objectives and Key Results (OKR). Their OKRs include reducing customer pain in one area of the product that takes customers too long to successfully complete. Typically, the Product Manager, UX expert, and engineer work together to design and conduct research via observation and low-fidelity prototypes. Once completed, the entire team gets involved to discuss their findings to identify the best bet for improving the user experience and reducing customer pain. They conduct a brief Structured Conversation, identify several backlog items with clear acceptance criteria, and proceed to run a discovery sprint to try out their ideas. At the conclusion of this discovery, the team reviews the outcomes of their key results using both qualitative (NPS or Net Promoter Score) and quantitative (time on task data instrumented into the product) methods. Adjustments can be made and retested in another round of discovery and delivery. The other forms of interdependence identified by organizational theorist James Thompson are sequential and pooled. These are less complex forms of interdependence, and require standardization and planning to achieve. Reciprocal interdependence, the most complex form of interdependence, embodies how agile teams need to collaborate, whereby the team mutually adjusts uncertainty and change. Why are Teams in Pain? To this day, I witness product development teams constantly stressed about who does what during a project lifecycle. They struggle with knowing how to ask for help, how to get help, and how to help each other. They are unaware of each other’s personal development goals, and don’t consider how they can be a resource to each other. Team members can feel overwhelmed with too many requests for help from teammates while others feel underutilized. Too often, this weakened form of “teaming” results in less than satisfying product results. This results in lower personal motivation and job satisfaction. I have found a way to make this unhappy teaming situation better. Social contracting includes making explicit agreements that starts from a place of genuine curiosity about your teammates. What goals do we have? What skills and knowledge do we possess? Can we help each other develop and grow as we collaborate toward shared product outcomes? Answering these questions leads to mutual understanding of each other’s capabilities, builds a team with healthy interdependence, increases each person’s motivation, and leads to better product outcomes. To build and sustain healthy working relationship through team interdependence, I’ve developed a tool called the MatchUp Canvas. Whether you are forming a new team and conducting a Liftoff,  reconfiguring a team with changing members, or recognizing that your team could benefit from a reboot, one way to accomplish this is a social contracting tool I call the Matchup Canvas. 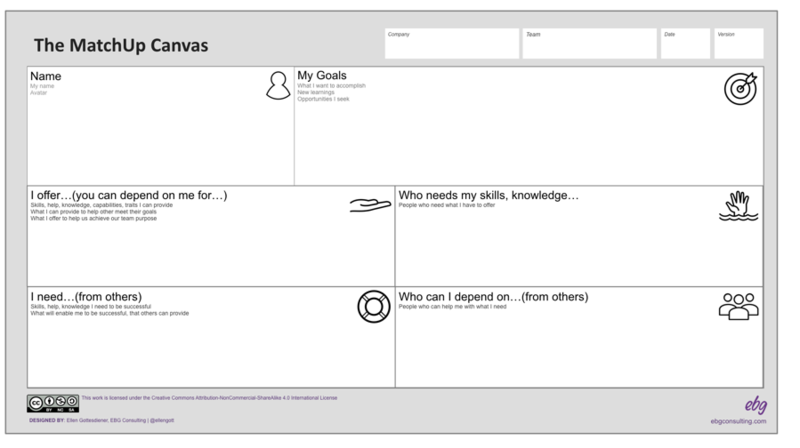 The MatchUp Canvas purpose is to serve as means to help teams make explicit agreements about how they will improve their mutual interdependence. The value is in the activity the teams engages in to deliver their MatchUp Canvases to and with each other. I’ve combined the MatchUpCanvas together a set of instructions for using the MatchUp Canvas as a download package. Great teams act interdependently to achieve product outcomes. That doesn’t happen by accident. It takes deliberate effort. By proactively determining how teams depend on each other, agreements can be made on the “give and take” required to improve teamwork. Doing so strengthens team partnerships and customer relationships. Ultimately, this leads to better product outcomes and makes work more joyous. The MatchUp Canvas is a tool you can freely use to facilitate great teamwork. Please share your experiences, comments, and suggestions by emailing me at ellen@ebgconsulting.com. Wodtke, Christina. Radical Focus: Achieving Your Most Important Goals with Objectives and Key Results. Cucina Media LLC, 2016. Thompson, James D. Organizations in Action: Social Science Bases of Administrative Theory. New York: Routledge, 2017. Schwarz, Roger. “Is Your Team Coordinating Too Much, or Not Enough?” Harvard Business Review. March 23, 2017. https://hbr.org/2017/03/is-your-team-coordinating-too-much-or-not-enough. Weisbord, Marvin R. Productive Workplaces Revisited: Dignity, Meaning, and Community in the 21st Century. 2nd San Francisco: Jossey-Bass, 2004. Riordan, Christine and Kevin O’Brien. “For Great Teamwork, Start with a Social Contract.” Harvard Business Review. April 17, 2012. https://hbr.org/2012/04/to-ensure-great-teamwork-start. Larsen, Diana and Ainsely Nies. Liftoff: Start and Sustain Successful Agile Teams, Second Edition. Raleigh, NC: Pragmatic Bookshelf, 2016. Very well done. Thanks for continually sharing the results of your research and your knowledge with the community. I will add this to the list of resources I provide to the business analysts I train.